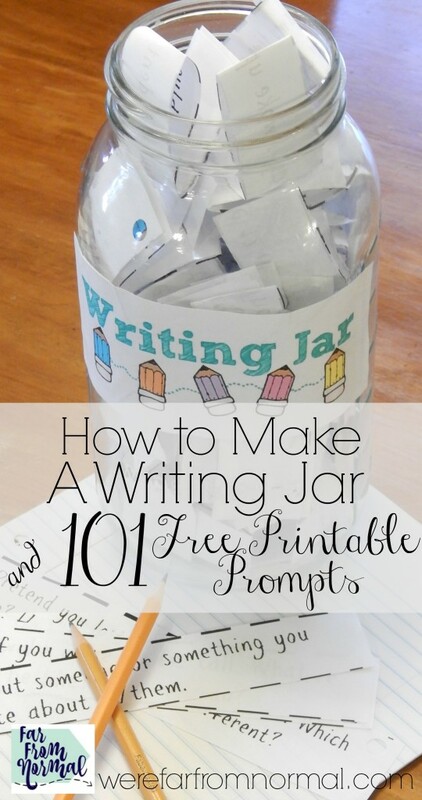 Add some fun and creativity to your writing lessons with this great writing jar! 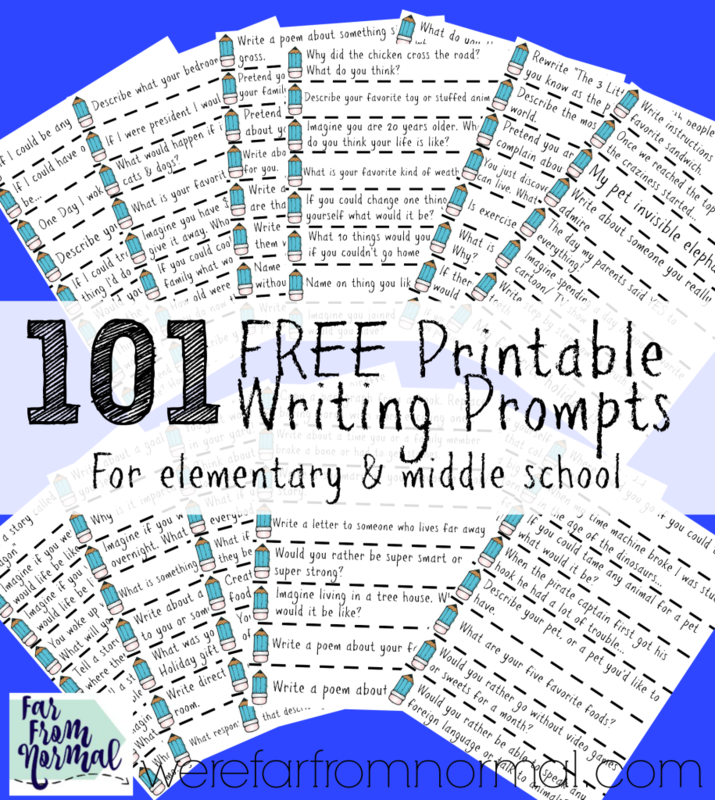 Get kids excited about writing with 101 free fun, thought provoking, and exciting printable writing prompts! That was the response I got from my 13-year-old when I said we needed to incorporate more writing into our homeschool. He tried to argue that because he is able to physically write letters and form sentences that he doesn’t need writing practice. I’ve never used a specific writing or grammar curriculum because I don’t want writing to be a chore. I want it to be something creative for them, a way to share ideas, something that they can come to enjoy as much as I do…. or at least not dread it. I wanted to put together something that is easy for me as a teacher, got them going by themselves and was… dare I say… Fun! “This is actually kind of cool… for school that is.” Was the response I got from Daniel (the 8 year-old)… I’ll take that. The idea here is to have a jar full of writing prompts, the ones I’ve included have a big range. I tried to include thought-provoking, serious, funny and creative, so that each time they reach into the jar they’ll be challenged with a different kind of writing and style. It helps keep it from being boring and exposes them to lots of different ways of writing. Of course you can fill it with your own prompts… whatever works for your homeschool. #1- “Why? is implied” – There are some prompts like, “What is your favorite song?” Or “Write about someone who inspires you.” Or “If you could only say 20 words for the rest of your life what would you pick?” They don’t all have “Why?” written after them. I told the boys that if there is one where “Why?” makes sense at the end of it that is part of the question. #2- Set Standards- For Daniel who is in 2nd grade he is expected to write 5 sentences and make sure to use capital letters and punctuation. For Nathan, in 7th grade, I want to see a well thought out thesis statement or topic sentence, proper use of punctuation and more complex sentences. You can set the standards for whatever level your child is working on. #3- There are a lot of ways to use this– Some kids need a little help getting started on a daily journal. These are great starting points for entries that only take 15 minutes or so. You can also use them as complete writing projects with a first draft, revisions and final draft. Or just use them as part of your Language Arts a couple of times a week. There’s no right or wrong way to use this idea! #5- Use them once or many times– At first I planned to have them glue the prompt to the top of the page before starting. I decided though that it might be fun to have them write the same responses multiple times so back in the jar they go. The choice is yours. You could also just set the used ones aside until you’re running low and then refill the jar. I started them each with a new notebook when we started using the jar so that as we go it will be easy to see their writing develop, and go back and read the responses to the prompts! I printed my prompts full sheet size. If you have a smaller jar or want to conserve paper & ink you can choose to print them as a 5×7 the words will still be big enough to see. I’ve also included a blank page so that if you want to write in your own they can match all the others! To get all the prompts delivered right to your inbox just fill out the form below! 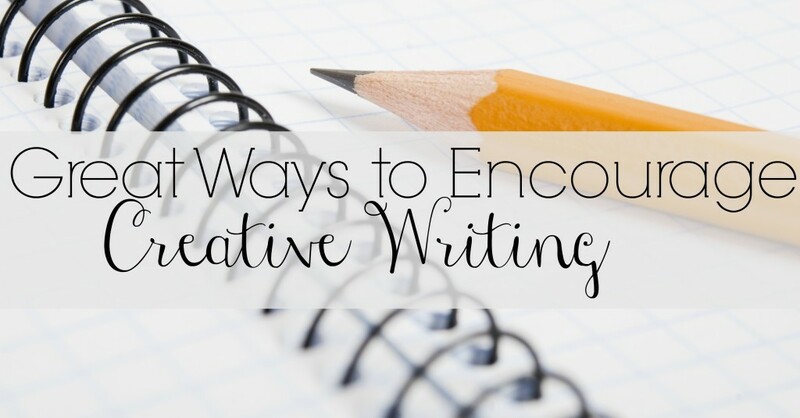 You’ll be able to download all 101 of them, print them out, and get started writing right away! 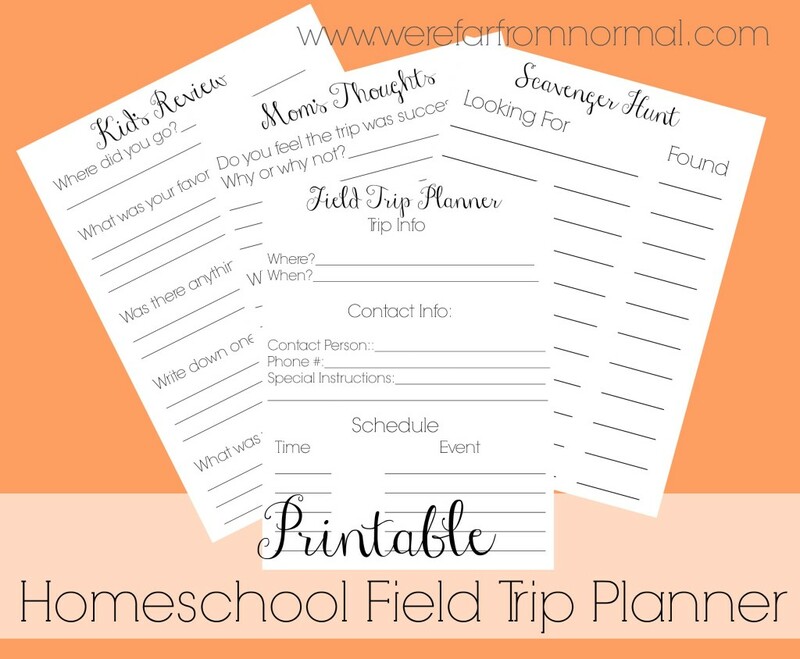 I hope these are as useful for you and your homeschool as they have been for ours! Come back and let me know which ones your kids enjoy & how the writing jar is working for you! Us too! So I tend to avoid it, this makes it a lot easier! Yes. A writing jar sounds about perfect! Thank you so much for this! i have been wanting to incorporate more free writing into our homeschool and these are perfect! I started to do some on my own, but nothing as cute and helpful as this! So glad you’ll be able to use it! My boys have loved using it, it makes writing so much easier! Let me know how it works for you! Thank you so much for creating this writing jar! My kids are going to enjoy their writing!! Thanks for the free resource. Please check your spelling of “weird” on page 1. Thank you so much for this valuable resource! This saves a lot of time and work developing good writing prompts and also gives excellent daily writing practice to my kids! I teach 4th and 5th grade; it’s the end of the school year and my kiddos are getting antsy! I am going to throw these into our Writing station for our Language Arts rotations. I think it will really get them excited about writing in these last few weeks! Thank you! That’s so great to hear! I can’t imagine having a whole classroom full of kids waiting for summer vacation, hope this helps! senior volunteer in the local school . I am not up on this computer stuff. Thank you so much for the ideas!!!!!!!! Great work!! Thank you very much for sharing this idea!!! Thanks for sharing. I’ll do it on Monday and I tell you. I just downloaded all these writing prompts. I’m very excited. My girls may not when they see my plan for the summer. Each will have a journal for them to write in everyday or at least most days. I have multiple reasons for this. They both need to work on handwriting skills, I want to fight the phrase “I’m bored”, and I want to get them thinking creatively. They are very serious and straightforward and I want them to branch out a bit. I can’t wait to read their responses! Where is the form to fill out to get the writning prompts?? I’m wanting to incorporate journaling into our homeschool. Thanks! There should be a form in the body of the post! I couldn’t resist commenting. Perfectly ᴡritten! I keep trying to get the writing prompts sent to my email, but they never show up! I have tried multiple email addresses for the last two days. Help please!